What a sad story. 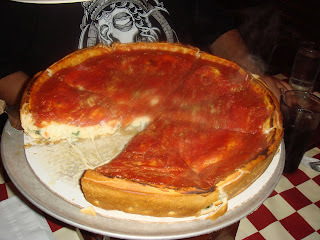 Giordano’s is a leader and well-known institution in Chicago’s stuffed crust pizza game. It owns 10 corporate stores and manages 35 franchised locations in Illinois and Florida. Somehow this chain, where people (often tourists) stand in long line for an overrated $20 deep dish pizza, owed $45 million to a lender and had to file bankruptcy in February when it stopped paying back a note. Bidders for the company include the parent companies of Gino’s East and Connies Pizza. It sounds like they over-leveraged their real estate acquisitions and didn’t have enough income for debt coverage. Giordano’s was acquired by VPC Capital Partners in Chicago for $52 million. It’s chairman, Richard Levy, hopes to elegantly apply his legal, bio-pharmaceutical, and energy background into the pizza industry, an obviously natural next step for him and sure to reassure franchisees. Luckily, the Giordano’s family is going to stick around and collect big salaries to help out. Don’t the new owners look happy in this picture (pic courtesy of Chicago Tribune) to the right? They have BIG plans for the brand, hoping to clone the success of Paul Newman’s $200 million grocery business including developing a line of products for grocery stores “similar to what Paul Newman has done for salad dressing” and expanding the restaurant footprint beyond its Chicago and Florida markets. That is not a pizza! It looks more like lasagne. No wonder they went bankrupt. Your mother looks like a bowl of spaghetti.